At breakfast this morning, Ricky and I decided that it might be a good idea to add a couple of new hens to our flock since the girls are aging and not producing as many eggs. Not to mention if something were to happen to one, the other would be on her own and as flock animals that’s not such a good thing. We actually had a close call with Blanch last week, we noticed that her demeanor had changed and she was not feeling well. After some Google searches we determined that she had become egg bound and needed some assistance in getting a stuck egg out. Blanch taking a warm bath to help release her bound egg. We took matters into our own hands and filled an old cooler with hot water and submerged her in it for about 30 minutes. She took to the bath immediately and never tried to get out, in fact she sort of relaxed and closed her eyes off and on. We then got her out and carefully dried her off and set her back in the coop. The next day we noticed that she was sitting in her nesting box and was successful in laying her stuck egg! She was back to normal soon thereafter. Crisis averted! 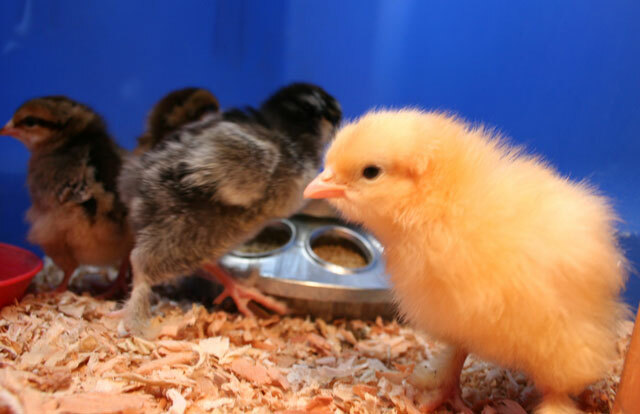 So today we called up our farm supply store to see if they had any chicks available. Lucky for us they had three different breeds that were born only 2 days ago. 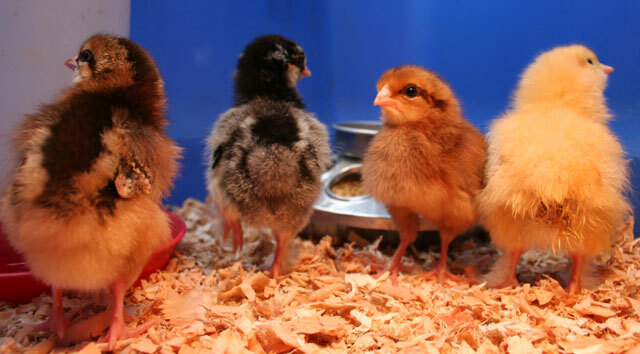 We picked out 4 different chicks 2 different color Giant Cochin, a Welsummer, and a Sussex. We set up a brooder for them on our back porch that is just high enough for Eli and Judah to look in, but they “hopefully” can’t knock over or reach in. They won’t be ready to mix with our other hens until they are the same size and can fend off any malicious pecking order attacks. Eli is super stoked and loves watching the new little ladies.